Nigeria on Tuesday declared a Lassa Fever outbreak in the country. 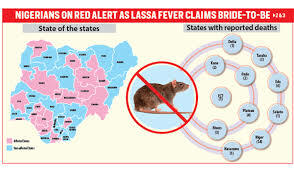 This followed the increase in the number of Lassa Fever cases reported in states since the beginning of the year, the Nigeria Centre for Disease Control said. “The RRTs will work with states in response coordination, contact tracing, case management, risk communication and strengthening infection prevention and control practices,” it stated. “Since the Lassa fever outbreak in 2018, NCDC has worked with states to ensure better preparedness and improved response. In the last one year, guidelines have been revised, new data management tools have been developed and the laboratory network has been strengthened. Additionally, risk communications has been strengthened through radio, posters, flyers and social media,” it said. “A national research plan has been developed, to enable its full integration into the outbreak response to gain a better understanding of the disease”, NCDC said. NCDC has pledged to remain committed to supporting all states’ public health teams to prevent and respond to public health threats.